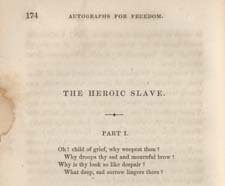 Frederick Douglass, 1818-1895 The Heroic Slave. From Autographs for Freedom, Ed. Julia Griffiths. The Heroic Slave. From Autographs for Freedom, Ed. Julia Griffiths. Boston: John P. Jewett and Company. Cleveland, Ohio: Jewett, Proctor, and Worthington. London: Low and Company., 1853. Louisiana State University provided the text for the electronic publication of this title.